In a replay of the Federal Bureau of Investigation’s infamous COINTELPRO operations targeting the left during the 1960s and ’70s, America’s political police launched raids on the homes of antiwar and solidarity activists. Rummaging through personal belongings, agents carted off boxes of files, documents, books, letters, photographs, computers and cell phones from Minneapolis antiwar activists Mick Kelly, Jessica Sundin, Meredith Aby, two others, as well as the office of that city’s Anti-War Committee. Amongst those targeted by the FBI were individuals who organized peaceful protests against the imperialist invasion and occupation of Iraq and 2008 protests at the far-right Republican National Convention in St. Paul, Minnesota. As Antifascist Calling reported in 2008 and 2009, citing documents published by the whistleblowing web site WikiLeaks, state and local police, the FBI and agencies such as the Department of Homeland Security, the Pentagon’s Northern Command (NORTHCOM), the United States Secret Service, the National Security Agency and the National Geospatial-Intelligence Agency implemented an action plan designed to monitor and squelch dissent during the convention. As part of that plan’s execution, activists and journalists were preemptively arrested, and cameras, recording equipment, computers and reporters’ confidential notes were seized. Demonstrations were broken up by riot cops who wielded batons, pepper spray and tasers and attacked peaceful protesters who had gathered to denounce the war criminals’ conclave in St. Paul. 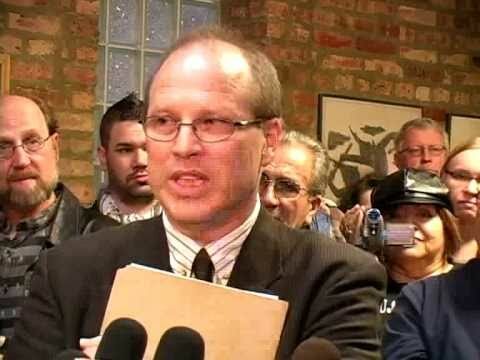 On Saturday, Sept. 25, 2010 a press conference was held to protest the FBI raids the day before on Chicago-area anti-war activists. In an attempt to intimidate and silence activists critical of U.S. foreign policy and militarism. Joe Iosbaker and his activist wife Stephanie Weiner had their home invaded by the FBI and searched for 12 hours. They even put in “evidence” bags drawings that their children made. Includes comments by their attorney Melinda Power. The space at the West Town Community Law Office was packed with about 75 supporters from numerous community and anti-war groups who made enthusiastic chants of solidarity at the end of the press conference. Iosbaker vowed that this McCarthy era-type government intimidation will not deter the anti-war movement from building an upcoming Midwest regional march on Oct. 16. Length – 9:28. Produced by Labor Beat. Labor Beat is a CAN TV Community Partner. Labor Beat is a non-profit 501(c)(3) member of IBEW 1220. Views are those of the producer Labor Beat. For info: mail@laborbeat.org, www.laborbeat.org. 312-226-3330. For other Labor Beat videos, visit Google Video, YouTube, or blip.tv and search “Labor Beat”.